There have been far too many instances of Gaelic football or hurling matches where colour-clashes have been ignored. On the very evening that we write this piece, this game took place. Therefore, it’s probably a bit churlish to complain about an instance where one was avoided. However, this makes the cut simply for the lack of logic employed. For the uninitiated, there are two main competitions in Gaelic games, the league and the championship, the latter run along the lines of a knockout cup but considered more important. While the league is played on a home-and-away basis (generally only playing each other once in groups of six or eight), the bulk of championship games are played at neutral venues. In practice, that doesn’t always happen, but it is generally the case for games in the championship, unless both teams have the same alternative colours, in which case only one changes. In the league, though, it’s usually the home team that changes, which is why the incident this article focuses on is so strange. In March 2002, Donegal (gold/green, on right) travelled to face Roscommon (gold, or ‘primrose’, offically, and blue, left) in a football league game. Given the similarity, a change was required. Just under two years previously, Roscommon had been at home when the counties met and they changed to blue and one would have expected similar. Instead, Donegal wore those same blue Roscommon jerseys with the home side in their usual attire. The best explanation that we can come up with is that, rather than forgetting to bring a change set, Donegal neglected to bring any jerseys. Their goalkeeper Tony Blake did wear his usual green top, ensuring that sponsors Abbey Hotel got some exposure, while his opposite number Derek Thompson had to switch from his usual blue to avoid clashing with his own county’s alternative shirts. The next time the counties played in Roscommon, in 2004, it was the Rossies who were wearing blue. 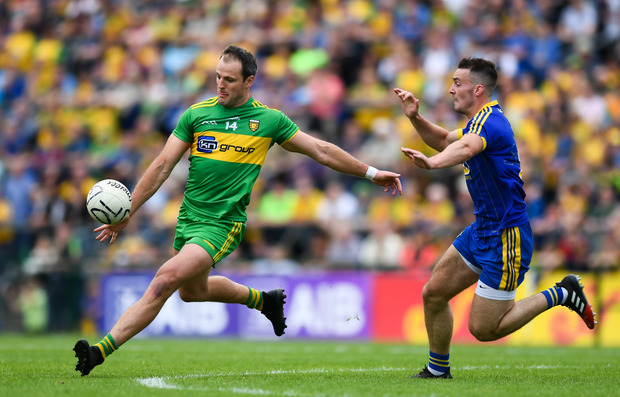 Recent meetings have seen both counties change – blue v white in the league in 2016 and blue v green/gold (Donegal’s original format) in the championship in 2018.